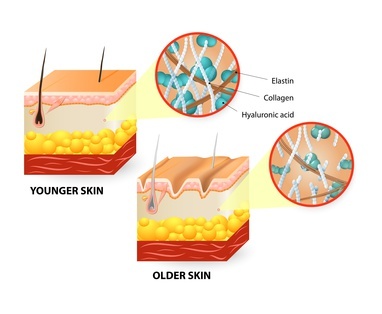 Hyaluronic Acid Skin Care helps keep our skin young looking. Hyaluronic Acid (hyaluronan or HA) is a complex type sugar created by the body naturally, although its production is slowed down as we age. It’s main purpose is to lubricate and cushion our eyes and joints, keep our immune system healthy and help combine fibers and tissues for a strong structure to keep our skin firm, plump, and elastic. As we continue to lose this important natural component of our skin structure, dryness, wrinkles and normal skin damage will occur. Since aging of the skin is associated with moisture loss, various products are available to help preserve or regain hyaluronic acid. Hyaluronic Acid attracts more than 1000 times its weight in moisture which makes it very popular in the cosmetic industry and is used in many anti aging products to provide amazing moisturizing benefits. Topical products that contain HA can be used directly on the skin or combined with your other rejuvenating products. Keeping your skin hydrated will also help to keep those unkind lines plumped and less noticeable and new ones from forming. When looking for products, look for a trusted, quality brand with cosmetic-grade hyaluronic acid or sodium hyaluronate ingredients in the formula. This substance works especially well with Vitamin C products, Both acids together have great cell communicating abilities and are easily absorbed to help assist in a more effective penetration. Vitamin C (ascorbic acid) alone is an amazing collagen boost on its own, helping the skin retain its firmness. Vitamin C has many other antioxidant qualities to improve skin such as correcting pigmentation problems, healing, and its great protection it offers against UV radiation. Many studies continue to find better methods to enable better penetration of hyaluronic acid through topical application treatments. Nothing yet compares to cosmetic injections by a physician. Fillers/ hyaluronic acid injections is a popular treatment to increase volume and fullness. It will help restore facial contours and reduce the look of lines and wrinkles and correct folds. A few brand names of HA fillers include Juvederm, Perlane, and Restylane. For more information on dermal fillers – check with your doctor whether this procedure is right for you. Foods high in hyaluronic acid can also be added to your diet to increase HA in your body. Potatoes, sweet potatoes, carrots, broccoli, leafy greens (spinach, cabbage and kale) are good choices. Also include Vitamin C-rich fruits ( ex. Oranges, grapefruit, blueberries cherries, cranberries), and meats such as beef, turkey, lamb and veal.